Flu vaccine is safe for people with egg allergies: Why I vaccinated my child. Doctors now say that the flu vaccine is safe for people—including kids—with egg allergies. My 5-year-old son is extremely allergic to eggs. Flu vaccines are produced in eggs. Should I vaccinate him anyway? Lurking beneath that question are two parts of me at odds with each other: a calm, rational scientist and a nerve-wracked, emotional parent. Rationally, vaccines have a long track record of safety and efficacy at preventing a host of deadly infectious diseases. Thousands of people die every year from the flu in the United States alone, and this year, we are seeing evidence that the H1N1 strain (the cause of the 2009 swine flu pandemic) is surging, with very serious cases and even deaths being reported in otherwise healthy individuals. Young children are a particularly vulnerable population. I know the data. Yet, my son’s egg allergy unleashes the anxious parent-beast within. Because of a potential risk for allergic reactions, previous medical advice recommended that people with egg allergies avoid flu vaccines. People with egg allergies, like people who are too young for certain vaccines or whose immune systems can’t handle them, had to rely on good old hand-washing and herd immunity for protection—which is not so reassuring for a 5-year-old who regularly shoves his hands in his mouth and is surrounded by a herd of half unvaccinated children at school. Luckily, those recommendations have been completely reversed. This past fall, one of the nation’s major allergy organizations, the American College of Allergy, Asthma and Immunology, released a new position statement that the flu vaccine is safe for people with egg allergies and recommended that all egg-allergic individuals, regardless of egg-allergy severity, receive the flu vaccine. For the calm, rational scientist part of me, this was welcome news. But the nerve-wracked parent part was terrified. When I got word that the recommendations changed, I did not immediately think: “Sign us up!” Once you witness the terror of anaphylaxis, the most severe, life-threatening allergic reaction, paranoia takes hold and reason flies out the window, even for a scientist. In managing my son’s life-threatening food allergies, I have learned that reactions are highly unpredictable even within the same person. When my son was about a year and a half old, we learned the hard way that “made on shared equipment with egg” can in fact cause anaphylaxis. Traces matter. I was terrified of my son getting the vaccine. In my mind, I imagined widespread hives, swelling, vomiting, and shock. Visions of my worst nightmare played in a continuous mental loop—anaphylaxis and the failure of a shot of epinephrine to reverse my son’s reaction—all because of a “stupid” flu vaccine. I’d much prefer my chances with the flu, thank you. Or so I thought. Through much coaxing from our clinicians and my own searches of the primary scientific literature, my spouse and I made the decision to do it—my highly egg-allergic son would take the plunge. In the allergist’s testing area, JR plopped down at his favorite table, one next to the window. (Yes, we go there often enough that he has a favorite table.) The room, illuminated by stark white fluorescent lighting and filled with four gray rectangular tables surrounded by equally drab, cold, and hard plastic chairs, offered little comfort for the task at hand—injecting an egg-derived flu shot into the tiny arm of a hugely egg-allergic boy. This was not the first time our family had cozied up to that same exact table because of eggs. This past summer, we nervously awaited the beginning of an oral food challenge, which we hoped would culminate in the successful consumption of a hard-boiled egg. To start the challenge, the nurse smeared egg on JR’s lips. Within 10 minutes of receiving the world’s worst lip balm, JR broke out in bodywide itching, nasal congestion, and hives. Hope gone. It would take a lot of convincing before I would allow anyone to inject possible traces of egg into my son following his widespread reaction to just one little kiss of egg. I needed to see the evidence with my own eyes and not just some position statement or one doctor’s word. Fortunately, that evidence consisted of some of the most straightforward and convincing data I have seen in some time regarding allergies. As a scientist, I greet studies with a healthy dose of, “Oh, you claim x? Show me the data.” In a 2012 study published in the Journal of Allergy and Clinical Immunology, Des Roches et al. combined their data with that from 26 previous studies (most of them published since 2009) and found that of 4,172 patients receiving an injectable flu vaccine containing traces of egg protein, which included 513 with a history of a severe egg allergy, no cases of anaphylaxis were reported. When looking historically, the previous recommendation for egg-allergic individuals to avoid the flu vaccine seemed to be based on perceived risk with very little data actually backing it. According to David Stukus, pediatric allergist at Nationwide Children’s Hospital in Columbus, Ohio, “Whether that small amount of ovalbumin (egg protein) is actually present in the first place or enough to cause an allergic reaction in egg-allergic individuals was not really investigated in depth until 2009, when the H1N1 pandemic made so many sick.” So it is really thanks to 2009’s outbreak of H1N1 that we are having this discussion. This time around, make no doubt, my son would be protected against H1N1. Currently, any of the age-appropriate injectable flu vaccines are OK for people with egg allergies, but the Centers for Disease Control and Prevention does not recommend they take the intranasal vaccine, FluMist, due to a lack of data. This is unfortunate, since FluMist has been shown to be more effective at preventing flu than injectable shots in my son’s age group. 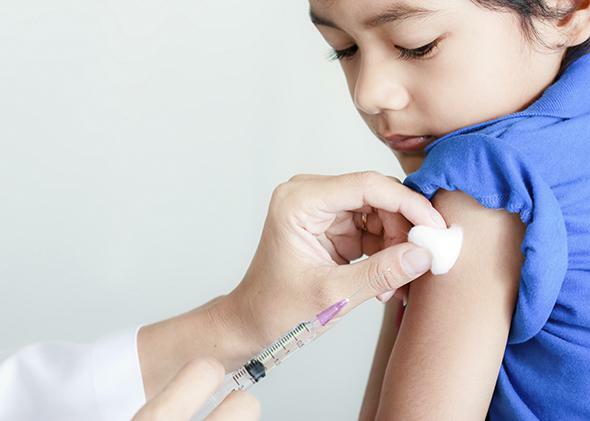 Two new, completely egg-free flu vaccines are also available, Flublok and Flucelvax, thus completely mitigating the risk of an egg-allergic reaction—although due to a lack of data, so far they are not recommended for children under 18 years of age. It’s not too late to protect you and your loved ones against the flu. I am happy that we now have this option, and the allergists I’ve spoken with are, too. “The release of these guidelines has had a huge and positive impact on the health of children with egg allergy,” says Michael Pistiner, a pediatric allergist and co-founder of AllergyHome.org. This is a good reminder that there are still medically vulnerable people who cannot get vaccinated. One of their best protections is herd immunity, the vaccine-induced protection in the rest of us that prevents us from passing diseases to them. Take the plunge—for yourself and for those who can’t.